Reviews | Blue Sprinkles - 10 lb. Put the finishing touch on all of your desserts with a burst of cool blue color from these fun, decorative sprinkles! They'll add sugary sweetness and unique texture to any dish. The uses of sprinkles are endless, making them a versatile ingredient to have on hand. Sprinkle these tiny, thin, rod-shaped confections into your signature cookie batter, atop a flavorful ice cream sundae, or use them to garnish frosted cupcakes. Whichever way they're served, they're sure to be a staple for your ice cream parlor, bakery, or diner. And with 10 lb. of sprinkles, you'll be in good supply! 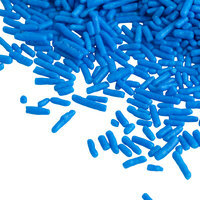 Blue Sprinkles in bulk, uh yes please! I use these on cupcakes, cakes, in sprinkle mixes, on sugar cookies. The color is great and the quality is obvious. I love how bright and vibrant this color blue sprinkles is. Use it to top your desserts on whipped cream or even on frosting cupcakes. it adds a great pop of color. I like the color of blue. I need to add blue to other rainbow sprinkles since they don’t include blue in the rainbow for some reason. The blue is also a nice shade for baby boy orders. The blue sprinkles are amazing and so bright in color. A fun way to decorate any baked good and we use them on our birthday cakes. These are okay. Not the exact color as the ones online but they still taste delicious. The color is still gorgeous and they are gonna look great on cupcakes. These sprinkles are awesome. They have a great color and taste and add a unique texture to our donuts. Occasionally the box will arrive in a rough condition; however, the sprinkles inside are not damaged. I swear my six year old lives in sprinkles as she puts them on EVERYTHING! I love these sprinkles.. Great color, flavor and size. Awesome price! These blue sprinkles are a great color. Very vivid and vibrant color. They taste fresh and are not too hard. I will definitely order again as they are less expensive then the brand offered by my food supplier. A great deep, blue sprinkle and a great topping for our donuts and pastries at our bakery. The sprinkles are excellent for themed parties and events. I have all kinds of different colors of sprinkles on my topping bar inside my ice cream shops. These have a good taste to them without the bad aftertaste that you get with some brands. A nice bright blue sprinkle that is great for decorating our "It's A Boy" ice cream cakes. We also use the sprinkles during the fourth of July. Is there honestly a bigger fan favorite than your classic sprinkles? I mean honestly, who doesn't reach for these? Nobody I know. These are delicious. The blue sprinkles are a bright blue and great for creating water scenes on cakes. I love the great packaging and the sprinkles have long shelf life. The best blue sprinkles on the market. The sprinkles taste great and have a great texture. The blue color is bright and perfect for decorating kids cookies and cakes. These sprinkles are great and such a good value! The color is perfect, the packaging is great and these are just what i needed for my business! We love these sprinkles. The vibrant blue color is always a hit with our young customers. They taste great, too! We will definitely purchase again. These blue sprinkles are vibrant and are a good addition to a mix of rainbow sprinkles. Much cheaper per ounce than smaller containers From a local grocery store. Such a bright and vibrant color to these sprinkles! I've ordered PLENTY of sprinkles in the past and these do not compare to what else is out there. If you are looking for great color look not more! The blue color is great and vibrant. You can do mix and match to save a little bit. I wish they carried other shades of blue however! Can anyone said anything bad about sprinkles? These work great when a single color is desired and the flavor is good too. We like that we are the only place in town that tops your ice cream with blue sprinkles. Overall great value. Will purchase these again. These arrived in a cardboard box with a plastic bag inside. May want to repackage to something easier to manage but overall satisfied with the product. The sprinkles are a beautiful bright blue. Just like they are in the photo. They bake very well and made some of our holiday cookies very special. These are great as a topping to add taste and texture. The color is great for and as is or for a theme such as a sports team party. We can't say enough about the quality of the sprinkles from webresturantstore.com. The colors are so bright, and the glossy sheen make them stand out on anything we put them on. We stock all of the colors offered and mix them to create our own color blends! These sprinkles were great for our sundae bar. the color in the picture matches the color you actually get. They taste good and 10# is a huge number so be prepared. These sprinkles taste like any other, but given the fact that the a certain movie is a big hit these work wonders in our store! They are blue, come in bulk and are cheap in price! Thanks WS! Fantastic color, but this sprinkle is inconsistent and sometimes arrives smaller than the other colors of sprinkle you can purchase from this brand. Color also tends to bleed quickly into frosting. I love the taste of these sprinkles! The value is awesome. It is more of a teal color than anything, but it is a fabulous color none the less! Absolutely LOVE this! It allows us to color coordinate our toppings for the different schools in our area and build brand loyalty. Awesome prices too! These are the cheapest sprinkles you can find even with shipping. I use them to mix and create the school colors for my local high school! I really enjoy the blue sprinkles. They are a great vibrant bright blue color and have a nice sugar taste and add a great crunch on the frosting. These sprinkles are the best! The color is vibrant and the packaging was great. I will order again in other colors.. The price is the best around!! I buy these sprinkles for my business all the time. They're great. The blue looks just like it does on the picture and they don't taste bad like some other sprinkles do.